Featuring cards that talk about baseball terms and vocabulary. Featuring first-ballot Hall of Fame inductees. Featuring pieces of game-used memorabilia. Looking for something different with your baseball cards? 2012 Triple Play Baseball is it. We're not talking traded players in new uniforms or some strange combination of serial numbered die-cut holographic reversed image rookie cards. 2012 Triple Threads offers a radically different art-based design unlike anything that has been seen in the modern hobby, at least on a large scale. Emphasizing interactivity and a low price, the set looks ideal for getting young collectors excited about the hobby. 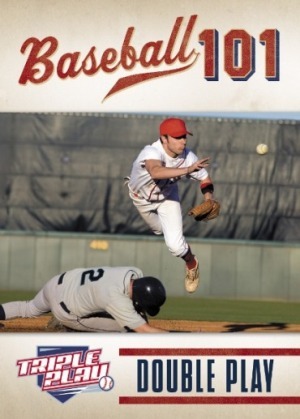 Running about a dollar a pack, 2012 Triple Play Baseball offers a broad mix of base cards, puzzle cards, stickers, tattoos and other inserts. They encourage collectors to actually use the cards and connect with them. It's the kind of product parents can buy for their kids and not stress out when they end up getting stuffed in a pocket or stuck to a school agenda. 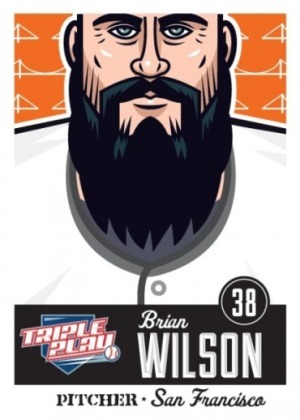 2012 Triple Play base cards use distinct artwork instead of traditional photos. Done in a cartoon style, players look exaggerated and larger-than-life. While the look may not appeal to some, it's not a bad thing. Many players look more like superheroes than baseball players. That's often how young people see professional athletes. The style is also a great way around the fact that Panini cannot use Major League logos. The art is colorful enough that many won't even notice. 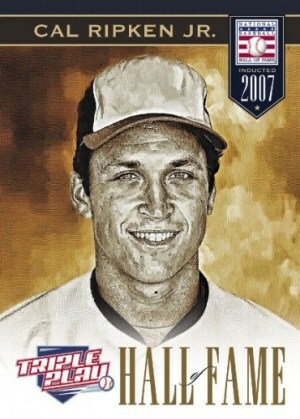 The 2012 Triple Play Baseball set has 90 cards. Each also has a trivia question on the back. 2012 Triple Play Baseball also comes with several inserts. Many are meant to be used and played with. 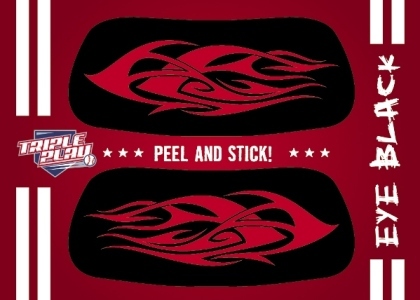 Eye Black stickers allow collectors to add another level of dress-up to their baseball uniforms. Made to be worn, the stickers have different designs that give a tattoo feel (in look, not durability). 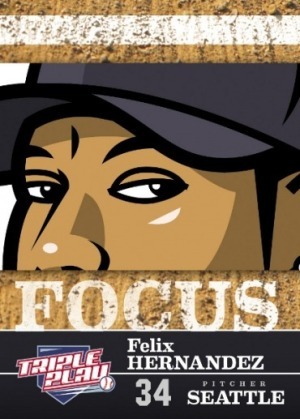 Focus zooms in on the eyes of one player from each team to stress their intensity. 2012 Triple Play Baseball is intended to be educational as well. Hall of Fame looks back on several first-ballot Cooperstown inductees. Not only are these the marquee names in the hobby, but they also share their greatness with a new generation. A little more practical is Baseball 101, which have playing tips and baseball-specific vocabulary. And what would a modern set be without its hits? 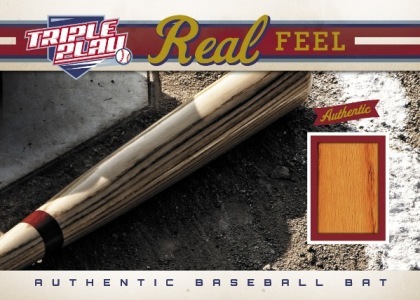 Real Feel have a piece of game-used memorabilia. Rather than focus on a player, they talk about the equipment itself and how they're made. While they may not appeal to hit seekers, the intention of 2012 Triple Play looks to be more about the game than the secondary market. Neat little product for a cheap price. An awesome little product for very young kids, like 6 – 10. I just picked up 2 boxes of these for my nephew when I babysit him, and when he’s good. One box is for him to play with, the other is as a keepsake I am giving to his mom to keep, so when he grows up and the box I give to him now is ruined, he will have something to remember when he’s a little older.